Mumbai is a frantic melange of India’s extremes. It is the country’s financial powerhouse and its vogue centre of fashion, film and after-dark frolics. Glistening skyscrapers and malls mushroom the city. In Mumbai you can dine at some of the finest restaurants in the country, and work off the appetite gyrating at ultrachic bars alongside Bollywood starlets and wannabes. With a pinch of gumption, a dash of adventure, an open wallet and a running start, there’s no excuse not to dive into the Mumbai madness head-first. 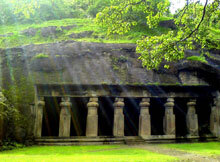 Elephanta Island- In the middle of Mumbai Harbour, 9km northeast of the Gateway of India, the rock-cut temples on Elephanta Island (Indian/foreigner Rs 10/250; caves 9am-5.30pm Tue-Sun) are a spectacle worth crossing the waters for. 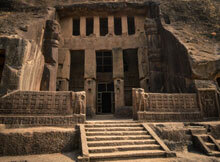 Home to a labyrinth of cave-temples carved into the basalt rock of the island, the artwork represents some of the most impressive temple carving in all India. The main Shiva-dedicated temple is an intriguing latticework of courtyards, halls, pillars and shrines, with the magnum opus a 6m tall statue of Sadhashiva – depicting a three-faced Shiva as the destroyer, creator and preserver of the universe. The enormous central bust of Shiva, its eyes closed in eternal contemplation, may be the most serene sight you witness in India. The temples are thought to have been created between AD 450 and 750, when the island was known as Gharapuri (Place of Caves). The Portuguese renamed it Elephanta because of a large stone elephant near the shore, which collapsed in 1814 and was moved by the British to Mumbai’s Victoria Gardens. The English-language guide service (free with deluxe boat tickets) is worthwhile, tours depart every hour on the half-hour from the ticket booth. If you prefer to explore independently, pick up Pramod Chandra’s A Guide to the Elephanta Caves from the stalls lining the stairway. There’s also a small museum on site, which has some informative pictorial panels on the origin of the caves. Sanjay Gandhi National Park- It’s hard to believe that within 90 minutes of the teeming metropolis you can be surrounded by the jungle of this 104-sq-km protected area (28866449; adult/child Rs 10/5; 7.30am-7pm Tue-Sun). Here, bright flora, birds, butterflies and elusive wild leopards replace traffic and crowds, all surrounded by forested hills on the city’s northern edge. Urban development and shantytowns are starting to muscle in on the edges of this wild region, but for now much of it remains a refuge of green and calm. One of the main attractions is the lion & tiger safari (Rs 30;every 20min 9am-12.40pm & 2-5.20pm Tue-Sun), departing from the tiger orientation centre (about 1km in from the main entrance). Expect a whirlwind 20-minute jaunt by bus through the two separate areas of the park housing the tigers and lions. 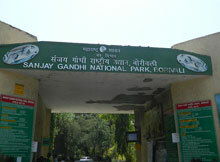 Inside the main northern entrance is an information centre with a small exhibition on the park’s wildlife. The best time to see birds is October to April and butterflies August to November. Another big draw are the 109 Kanheri Caves (Indian/foreigner Rs 5/100; 9.30am-5.30pm Tue-Sun) lining the side of a rocky ravine 5km from the northern park entrance. They were used by Buddhist monks between the 2nd and 9th centuries asviharas (monasteries) and chaityas (temples), but don’t compare to the caves atAjanta, Ellora or even Lonavla. 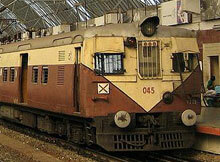 Train: Mumbai has an efficient but overcrowded suburban train network. There are three main lines, making it easy to navigate. The most useful service operates from Churchgate heading north to stations such as Charni Rd (for Chowpatty Beach), Mumbai Central, Mahalaxmi (for the dhobi ghat), Vile Parle (for the domestic airport), Andheri (for the international airport) and Borivali (for Sanjay Gandhi National Park). Other suburban lines operate from CST to Byculla (for Victoria Gardens), Dadar, and as far as Neral (for Matheran). Trains run from 4am till 1am. From Churchgate, 2nd-/1st-class fares are Rs 5/41 to Mumbai Central, Rs 9/76 to Vile Parle or Andheri and Rs 11/102 to Borivali. Avoid rush hours when trains are jam-packed, even in 1st class – watch your valuables. Women should take advantage of the ladies-only carriages. Car: Cars are generally hired for an eight-hour day and with a maximum of 80km travel allowed; additional charges rack up if you exceed these limits. Agents at the Apollo Bunder ticket booths near the Gateway of India can arrange a non-AC Maruti with driver for a half-day of sightseeing for Rs 600 (going as far as Mahalaxmi and Malabar Hill). Regular taxi drivers often accept a similar price. Motorcycle: Allibhai Premji Tyrewalla (23099313; www.premjis.com; 205/207 Dr D Bhadkamkar Rd, Opera House; 10am-7pm Mon-Sat) is the place to purchase a new or used motorcycle with a guaranteed buy-back option. For two- to three-week ‘rental’ periods you’ll still have to pay the full cost of the bike upfront. The company prefers to deal with longer-term schemes of two months or more, which work out cheaper anyway. A used 350cc or 500cc Enfield costs Rs 35, 000 to 60, 000, with a buy-back price of around 60% after three months. A smaller bike (100cc to 180cc) starts at Rs 25, 000. It can also arrange shipment of bikes overseas (Rs 18, 000 to the UK). Mumbai Airport: Mumbai is the main international gateway to South India and has the busiest network of domestic flights. The international airport (26829000; www.csia.in), officially renamed Chhatrapati Shivaji but still known as Sahar, is 4km away from the domestic airport, also called Chhatrapati Shivaji but known as Santa Cruz. 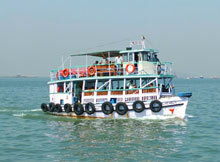 A free shuttle bus runs between the airports, which are 30km and 26km north of Nariman Point in downtown Mumbai. The international airport has two arrivals halls which have foreign-exchange counters offering reasonable rates, a Government of India tourist office booth (2615660, ext 4700; Arrival Hall 2A), a hotel reservation desk (66048772) and a prepaid taxi booth – all open 24 hours. 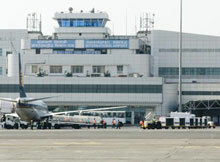 The domestic airport (26156600) has two terminals with foreign-exchange bureaus, ticketing counters and a restaurant-bar. The Government of India tourist office booth is in terminal B. Note that flights on domestic sectors of Air India routes depart from the international airport. Travel agencies are often a better bet than airline offices for booking international flights, and will reconfirm your flight for a small fee. There are flights to more than 30 Indian cities from Mumbai. Expect discounts if booking earlier or online. Kingfisher and Air Deccan offer flights to most of these destinations at the much cheaper Indian fares (up to 70% less). Bombay Hospital (22067676; 12 New Marine Lines) Close to Fort and Colaba. Breach Candy Hospital (23672888; 60 Bhulabhai Desai Rd, Breach Candy) Best in Mumbai, if not India. Royal Chemists (22004041-3; 89A Maharshi Karve Rd, Churchgate; 8:30am-8:30pm) A very reputable pharmacy. Sahakari Bhandar Chemist (23648435; Colaba Causeway, Colaba; 8am-10pm Mon-Sat, 10am-8pm Sun) Well-stocked and convenient pharmacy.